We are one of the leading suppliers, exporters and manufacturers of Riveting Tools, which are made using high quality mechanism. Riveting Tools are available in different shapes and also in different sizes. These are available as per the specifications and requirements made by the clients. These are specially designed and client can avail these riveting tools from us at reasonable price. 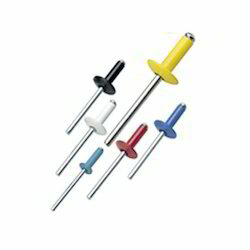 Our own is a distinguished association, which is occupied with offering Blind Rivet Large Head. The offered visually impaired bolts are produced utilizing excellent material that is sourced from dependable sellers. To meet variegated prerequisites of clients, we offer these bolts in different breadths and sizes. We are the successful provider of Blind Rivet Dome Head. Our experts take proper measures for the item not damaging the material and deform it. The coloration of the material is not affected by the product as it is given due importance by the company while manufacturing. This item is carefully packed to avoid corruption while transportation. Furthermore, the blind rivet dome head produced in increased flexibility of design.